Many of Earth’s most fundamental, planet-shaping processes occur in the ocean, out of human sight. The crust is built and consumed. Mineral-rich fluids spew from subterranean pipes. The majority of the planet’s earthquakes and volcanoes erupt beneath this watery blanket. Circulating currents move climate-driving heat and moisture around the globe. Strange creatures grow at depths beyond the influence of sunlight, providing a glimpse of perhaps the earliest life forms on the planet. You can observe many of these processes from a research ship, lowering instruments, cameras, robots, and submersibles. But such expeditions last a few days or a few weeks and can only provide snapshots. They don’t allow you to observe changes over months or years, nor can you capture sudden, unpredictable events unless you happen to be in the right place at the right time. Instruments on satellites offer useful broad and long-term observations of the ocean. But the view is only skin deep, as cameras and lasers can only penetrate the top few meters of water. Moorings, drifters, and buoys have revealed much of what we know about the patterns and changes in the sea. But until recently, such tools were limited by the availability of ships to deploy them, the size of computer memory, and the strength and longevity of batteries. To truly comprehend Earth’s dynamic behavior and to monitor how it affects us back on shore, ocean and earth scientists must do more than observe small regions for short periods. They need to establish a presence in the ocean—platforms from which to view how the ocean and seafloor change with seasons, years, and decades. They need outposts from which to spy the first tremors of an earthquake, the first roll of a tsunami wave, the first bloom of toxic algae. Advances in communications, robotics, computers, and sensor technology now make it possible to get wider views of the seas and to add the dimension of time to our big environmental questions. 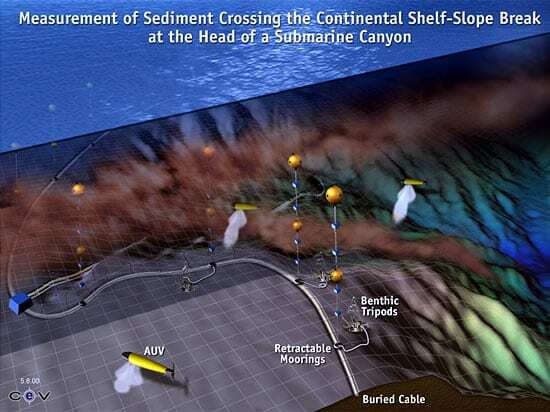 With arrays of permanent, Internet-linked moorings and underwater cabled observatories, researchers can observe the evolution of the ocean on scales from a single, prodigious hydrothermal vent to an entire tectonic plate of Earth’s crust. 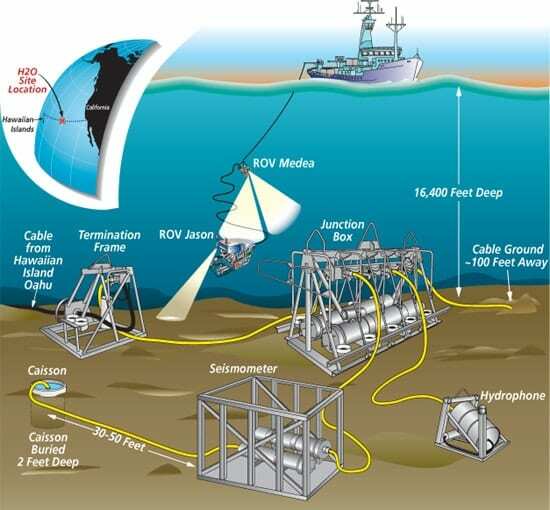 The power lines, fiber-optic data cables, solar panels, acoustic modems, and satellite transmitters on the next generation of ocean observing platforms will help turn hypotheses into understanding and help fit local and regional phenomena into the global picture.